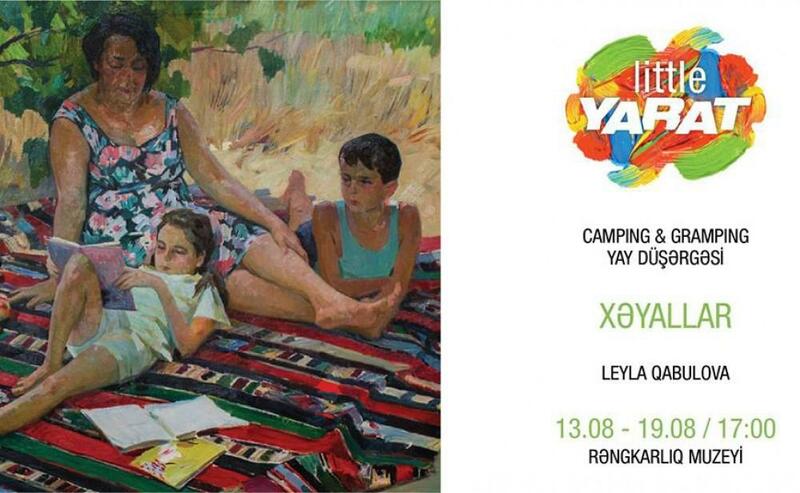 YARAT Contemporary Art Space invites children to join Camping and Gramping Camp with their grandparents. The event will take place at the Museum of Azerbaijani Painting of the 10th-11th Centuries on August 13-19. The programme is dedicated to the exhibition "Labour, leisure and dreams:1960s-1980s through the eyes of Azerbaijani masters". This exhibition brought together works by leading Azerbaijani painters painters Mikayil Abdullayev, Rasim Babayev, Sattar Bahlulzade, Gennady Brijatyuk, Nadir Abdurahmanov, Kamal Ahmed, Ujal Hagverdiyev, Igor Zhuk, Javad Mirjavadov, Boyukagha Mirzazade, Ashraf Murad, Toghrul Narimanbekov, Nadir Gasimov, Eldar Gurban, Maral Rahmanzade, Altay Sadigzade, Ogtay Sadigzade, Tahir Salahov, Khalida Safarova, Mahmud Taghiyev, Taghi Taghiyev, Farhad Khalilov, Gayyur Yunus who together defined a key period in Azeri Soviet art. The theme of following master classes is "Dreams". Master classes will be conducted by talented puppet-artist Leyla Gabulova. The works of event participants will be showcased at exhibition. It comprises YARAT Art Centre, ARTIM Project Space, YARAT Studios, YAY Gallery and an extended educational and public programme. YARAT Art Centre, a 2000m² converted Soviet-era naval building, opened in March 2015 and is the organisation's main exhibition space. The exhibition programme features new commissions by artists responding to the region. It supports and provides access to artists from the region, while engaging and introducing established, international artists. In October 2015, YARAT opened ARTIM, a central, accessible and dynamic space in Baku's Old City. ARTIM (meaning 'progress' in Azerbaijani) shows experimental practices and new work by emerging Azeri art professionals (selected through open call) and the international artists from the residency programme. It features multiple small-scale projects each year and hosts ARTIM LAB, a programme enabling young artists to engage in workshops and daily studio practice to generate new ideas and works. In 2016 YARAT launched a renewed residency programme. Aimed at developing young Azerbaijani voices and emerging international artists, the focus is on new, innovative practices and artists with an interest in the region. The residency programme hosts 6 international and 4 local artists a year at YARAT Studios’ spaces. programme that includes courses, workshops, lectures, screenings, festivals, literature and theatre clubs and family weekends, YARAT aims to give access to broad audiences of all ages. The public programme invests proactively in building communities and nurturing a wider understanding of, and participation in, contemporary art. President of Azerbaijan, Ilham Aliyev and the First Lady Mehriban Aliyeva.